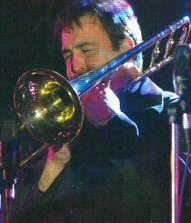 Lex 'The Rock God' Tier started playing trombone in Mildura at age 13 and then studied music at the Victorian College Of The Arts. He has worked with dozens of Melbourne bands and has worked as a session musician doing TV and radio jingles, album recordings and live performances for artists and bands including Russell Morris and Tina Arena. Lex is a specialised brass teacher with the Victorian Education Department. Concerts: Man Of The Hour, The Leeuwin Concert, The Last Time.